If you want to spruce up your page, there’s an app for that. 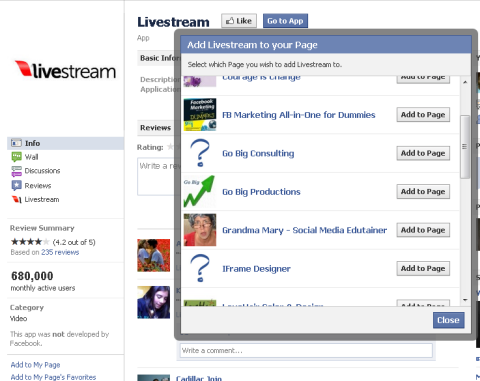 For example, Facebook apps can automatically showcase your YouTube channel, but they can also do much more. You may have seen the post Top 10 Facebook Apps for Building Custom Pages and Tabs, but let’s take a step back and talk about what apps are, where you find them and how you install them on your page. 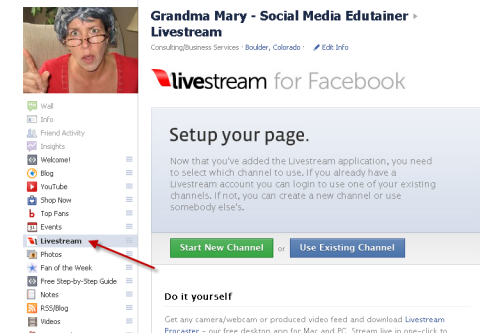 When you first start your Facebook page, there will be some basic Facebook apps in the left sidebar. These Facebook apps include Photos, Videos, Links, Events and Notes. Any other app you install will be a third-party app, which means that someone other than Facebook made it. 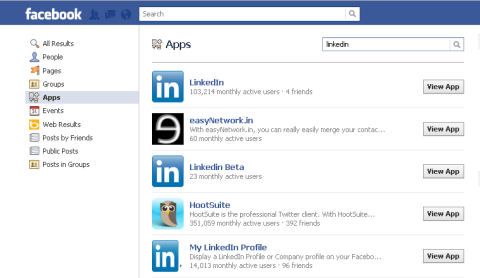 Click Edit Page from your Facebook wall and then Apps to see your installed apps. So how do you get more apps than just the basic ones provided by Facebook? First you find them and then you install them. Even though that might sound simple, both of those steps are not very straightforward. Finding apps on Facebook can be particularly challenging because the Facebook search feature is notoriously bad. Then steps used to install the app can vary. Some apps can be installed from within Facebook, others are easier to install by starting on the app website first. Sometimes it’s even difficult to tell an Application page from a regular Facebook fan page. An Application page will still have a Like button, a wall and sometimes its own apps installed. There are a few key ways to determine that it is actually an application. The page may have a Go to App button right next to the App button. Underneath the name of the app at the top, you will see the App classification. And then on the left sidebar you will see the Add to My Page link as you see in the figure below. 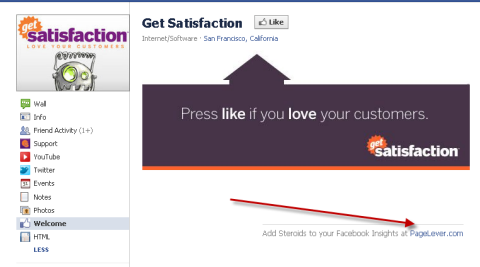 Note the different ways to distinguish a Facebook app from a regular Facebook page. An indication of how well the app is established is the monthly active users. In the figure above, you see NetworkedBlogs has 990,000 monthly active users, which can indicate that it is a useful and well-established app. Facebook applications also include games such as CityVille and Mafia Wars and some of the other apps you may have seen such as Give a Hug or the Birthday Calendar. If your Facebook profile starts posting strange things, you probably have clicked on a bad application. If you know the name of the application you are looking for, finding the app can be easier. You can use the Facebook search bar or go to www.facebook.com/search. Using the search tool is better because you can filter by People, Pages, Groups, Apps and more as shown in the figure below. Filter by Apps in the left sidebar to search for apps only. You can also find a Facebook app by taking a look at how something is posted within your news feed. Some apps will post into the news feed and you can find out more about the app by looking at the link underneath the post as shown by the HootSuite link in the following figure. If you click on the HootSuite link, you will be taken to the HootSuite app. Apps can be found by looking at the way they are posted. If it’s an app that only resides on a page, you can sometimes find out what the app is by looking at the bottom of the page. Many apps have either a link to their external website or a direct link to the app within Facebook as shown in the next figure. Not all apps have this feature and some are custom apps created for a specific page only. Check at the bottom of the app on the Facebook page to find out how the custom tab was created. Not all apps have this attribution. 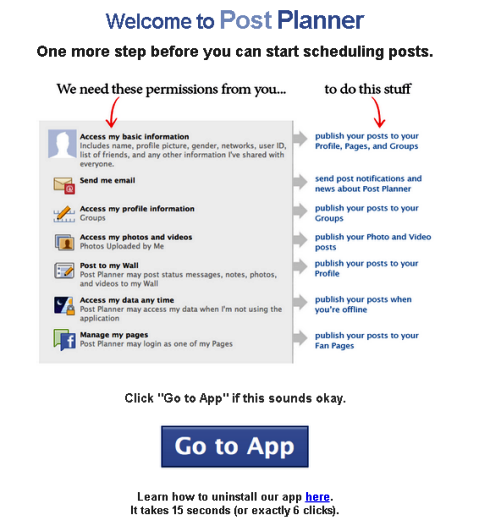 Another tool you can use to find Facebook apps is www.Appbistro.com. They don’t have every app listed but they do list a good cross-section of business apps. Once you have found a Facebook app, installing it can be challenging. Some apps install easier from their external website, and some are very easy to install from within Facebook. Many apps’ external websites will tell you exactly how to install it and make the installation process quite easy. Once you click Go to App, you will need to give the app permission to access your information. 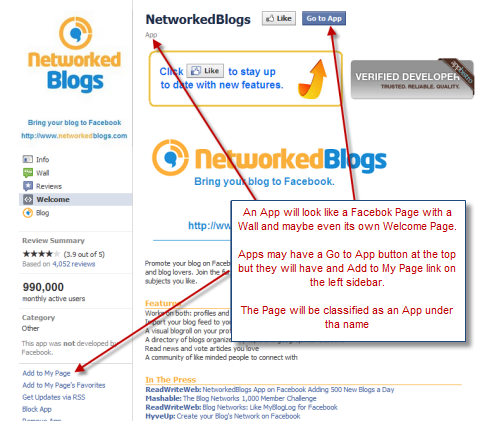 If you are installing the app from the Facebook App page, the steps will often be different if you click on the Add to My Page link on the left sidebar versus clicking on the blue Go to App button at the top of the page as shown in the NetworkedBlogs figure earlier. Usually you will eventually end up in the same place, but that Facebook “feature” makes writing directions on Facebook apps a challenge. I usually prefer to click the Add to My Page link on the left sidebar. When you do, you will see a pop-up box where you can select the page where you want the app added. 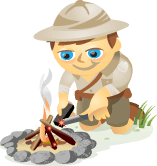 First click the Add to My Page link on the left sidebar, and then click the Add to Page button to add the app to your page. Now you will navigate to the page where you added the app and find the app listed on your left sidebar. Find the app on your left sidebar after you have installed it. After you click on the app, there may or may not be added steps to configure the app. Follow the steps as listed and you are all set with your fancy new app to dress up your page! If you would like to move the app position on your left sidebar, click on the Edit link under your complete list of apps on your left sidebar and then you will be able to drag the app to the position you want. When you have the list organized the way you want, click Done and the new position will be saved. Edit the position of the app with the Edit link. So now you have the big picture on what Facebook apps are and how to find and install them. What about you? What are your favorite Facebook apps? Leave your questions and comments in the box below.